^ a b c d Mahner, Martin (2013). Pigliucci, Massimo; Boudry, Maarten, eds. Philosophy of pseudoscience reconsidering the demarcation problem (Online-Ausg. ed.). Chicago: University of Chicago Press. p. 30. ISBN 9780226051826. Retrieved 18 April 2018. ^ Ascoli, Micol (2009). "Psychotherapy or religious healing? : the 'therapeutic' cult of charismatic Catholics in Italy". In Incayawar, Mario; Wintrob, Ronald; Bouchard, Lise. Psychiatrist and traditional healers : unwitting partners in global mental health. WPA series, evidence and experience in psychiatry. Hoboken, NJ: J. Wiley & Sons. pp. 229–236. doi:10.1002/9780470741054.ch18. ISBN 9780470741054. One or more of the preceding sentences incorporates text from a publication now in the public domain: Walsh, James J. (1911). "Psychotherapy". In Herbermann, Charles. Catholic Encyclopedia. 12. New York: Robert Appleton. One or more of the preceding sentences incorporates text from a publication now in the public domain: Bertrin, Georges (1910). "Notre-Dame de Lourdes". In Herbermann, Charles. Catholic Encyclopedia. 9. New York: Robert Appleton. ^ a b "'Faith healer' cleared of illegal practice". The Washington Post. Associated Press. February 21, 1956. p. 3. Retrieved 2007-11-12 – via ProQuest. (Subscription required (help)). ^ a b c "'Faith-healer' dies of polio". The Salina Journal. Salina, KS. December 17, 1956. p. 5. (Subscription required (help)). 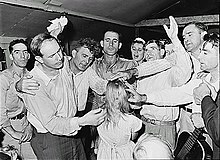 ^ "Faith healer Jack Coe dies". Corpus Christi Times. Corpus Christi, TX. December 17, 1956. Retrieved 2007-11-12. (Subscription required (help)). ^ "Jack Coe, evangelist, dies of polio". The Washington Post. December 17, 1956. Retrieved 2007-11-12. (Subscription required (help)). ^ "Jack Coe is dead at 38; Texas evangelist succumbs to bulbar polio". The New York Times. December 17, 1956. Retrieved 2007-11-12. (Subscription required (help)). Thomas, Northcote Whitbridge (1911). "Faith healing" . In Chisholm, Hugh. Encyclopædia Britannica (11th ed.). Cambridge University Press.